Rapeseed plant produces sunny, dandelion-yellow flowers around springtime. Rapeseed or canola seeds are harvested and then crushed to receive the oil from the seeds. This oil is always refined, has a light texture, pale golden color and a neutral taste. The canola meal after extraction is high in protein and usually used for animal feed. 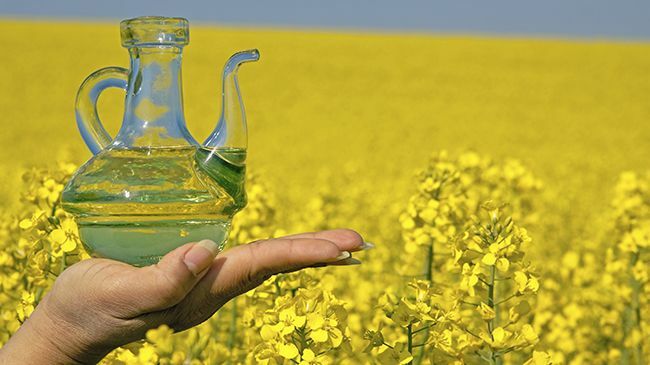 When purchasing canola oil search for expeller pressed, which means the oil was mechanically pressed without chemical solvents and although pricier, will guarantee that there are no solvents remaining in the oil. The oil used to be so toxic that the FDA banned it for human consumption in 1956, but through selective breeding programs in German universities, the bitter-tasting oil was reduced to a level that was safe for human consumption in winter rapeseed. Later in Canada, summer rapeseed was found with low levels of erucic acid (a monosaturated omega-9 fatty acid that can be toxic in large amounts). When Canadian growers bred the new variety of rapeseed with a lower content of erucic acid in the 19070’s they also decided it needed a new name. They called it “canola” which is coined from “Canadian oil, low acid” so consumers knew it was safe to consume. What are the benefits of rapeseed oil? Without fats and oils our bodies would not function properly so proper balance is necessary. We all know there are good and bad fats with saturated fats being worse and unsaturated fats being better. Rapeseed oil is a healthy choice oil, as it has a favorable balance of good and bad fats. Is rapeseed a good oil for hair? Rapeseed is perfect choice for dry hair. The unsaturated fatty acids possess strong moisturizing properties, which seem to coat the hair better than other oils. It is light and penetrates the scalp and shaft. With its excellent ratio of omega-6 to omega-3 fats it is considered to possess anti-inflammatory effects, which help to soothe an irritated scalp. This oil is great for hot oil treatments and scalp massages to aid with dryness and to add sheen to dull tresses. With its highest concentration of fatty acids being oleic and linoleic acid it is no wonder it does our hair some serious good! Oleic acid controls water loss in hair strands while making hair softer and more pliable whereas linoleic acid stimulates hair growth along with maintaining a healthy scalp. Oh and yes, it also controls water loss in your hair strands. Mix equal parts canola oil and mayo thoroughly. Add a few drops of your favorite essential oil for aroma and apply to hair before covering with a shower cap. Leave on for two hours. (No extra heat needed). Wash hair and style as usual. *An ampoule is a supercharged serum with higher concentrations of active ingredients. Equal parts of each oil should be used but how much will be determined by the thickness and length of your hair. Mix in a small bowl. Apply to hair and cover with shower cap overnight. Rinse and cleanse hair as usual. Do you have rapeseed in your DIY arsenal?